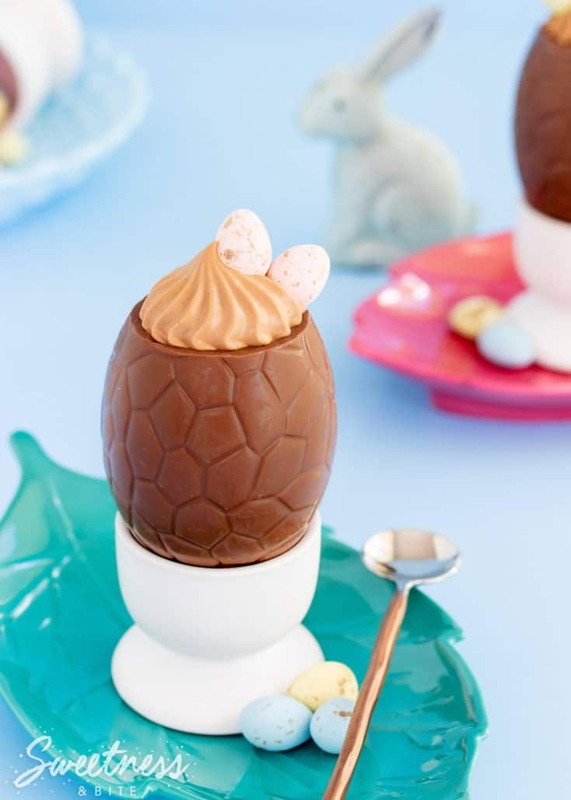 These easy milk chocolate mousse Easter eggs might just be my favourite Easter dessert. Like ever. If you’ve spent much time on this blog, or on my Facebook page, you’ll know what an unashamed fan I am of my chocolate mousse recipe. 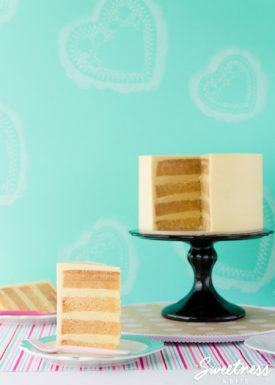 It’s the most viewed recipe on Sweetness and Bite, and it’s easy to see why – it uses only three ingredients, requires no eggs, and is super easy to put together. 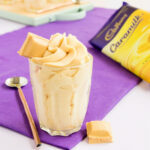 I’ve done a white chocolate version, and a Caramilk chocolate version but up until now I hadn’t got around to trying it with milk chocolate. Easter seems the perfect time to do that though, right? 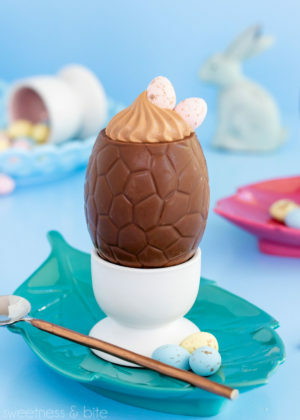 And what could make it more suited to Easter festivities than serving the mousse inside a hollow chocolate egg?! I’m a big fan of Easter, but I have to admit it’s mostly just because of the chocolate. Not that I ever need an extra excuse to want to eat chocolate. A day ending in ‘y’? Chocolate. 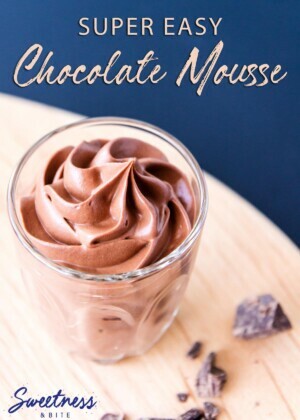 This mousse is slightly sweeter than the dark chocolate version, and as with all my other mousse recipes, I recommend using good quality chocolate to make it. 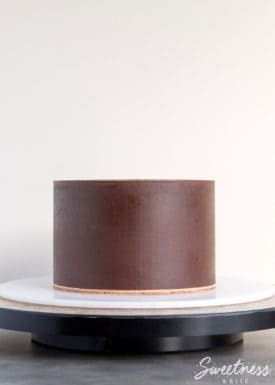 We’re not adding a ton of extra flavours which means the chocolate is the star of the show, and it’s well worth making sure your star is Lady Gaga or Beyonce rather than some D-list reality TV star. 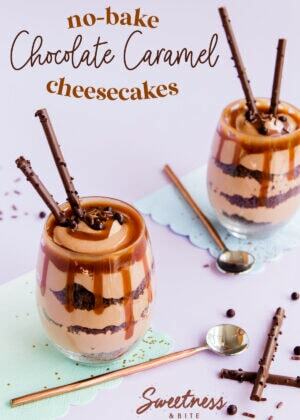 I used my favourite Whittaker’s milk chocolate, but as long as you pick a bar of chocolate that you love to eat, your mousse should taste amazing. 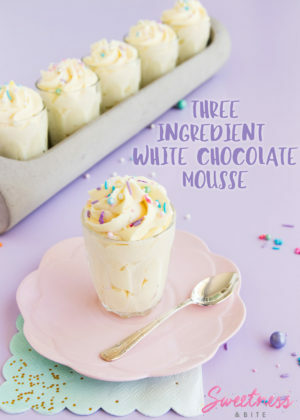 The number of servings you get from this mousse recipe will depend on the size of your chocolate eggs. These ones that I used were 50g hollow eggs and I filled six of them, with just a little dollop of mousse left over, which I may or may not have piped directly into my mouth #sorrynotsorry. You could also buy smaller eggs and get more servings. Probably the only tricky part about making this dessert is cutting the tops off the eggs. And really it’s not super tricky, it just takes a bit of patience to cut slowly and avoid cracking the egg. 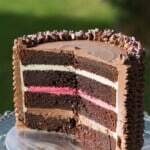 Warming your knife with hot water will help the knife cut more easily through the chocolate. Super important tip – make sure you cut a hole big enough to fit a spoon in. Unless you plan to shove a whole mousse filled egg into your mouth, in which case, by all means, be my guest. 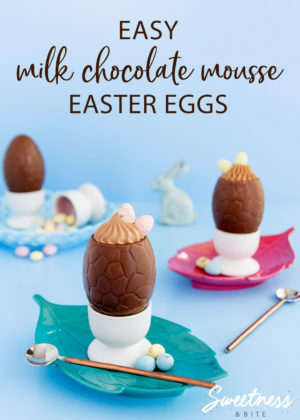 So simple to make, these Easy Milk Chocolate Mousse Easter Eggs are the perfect Easter dessert! 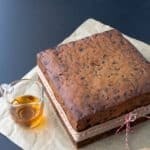 Only 3 ingredients and no eggs - except the chocolate ones! Heat the cream in a medium saucepan, over medium-high heat until bubbles begin to form around the edges. 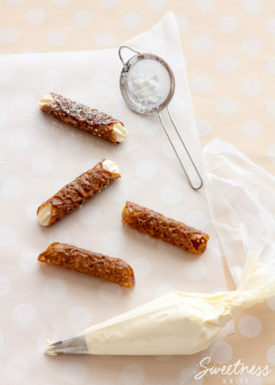 Remove from the heat and add in the chocolate and vanilla. Leave for a few minutes for the chocolate to start to melt, then whisk until the chocolate is completely melted and the mixture is smooth. Pour into a large heatproof bowl or jug, and leave to cool to room temperature (you can speed this up by placing the bowl into a water bath – simply 1/4 fill the sink with cold water, add some ice and place the bowl of chocolate cream into the sink. Stir the mix regularly to speed cooling). 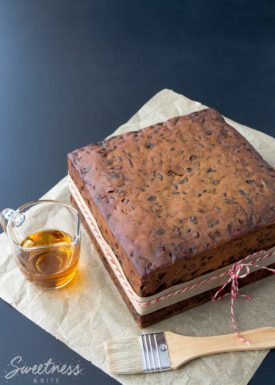 Refrigerate until very well chilled - at least several hours or ideally overnight. If you’re in a hurry you can place the bowl in the freezer to speed the cooling process. 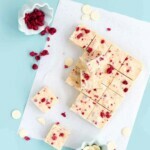 Just make sure you check and stir it regularly to make sure it doesn’t actually freeze! 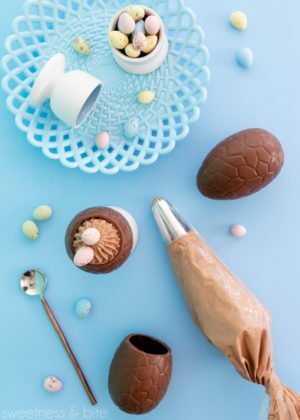 While the mixture chills, run a small sharp knife under the hot tap to warm the blade, then dry the knife and use it to carefully cut the tops off the easter eggs. It helps to work slowly and let the heat of the knife do the work. Run the knife under the tap and dry again as needed. Make sure that the holes are big enough to fit a spoon through! Place the eggs into egg cups or serving dishes to hold them upright. 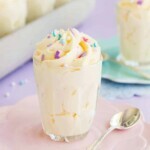 Once the mousse mix is fully chilled, whip it with an electric hand mixer until stiff peaks form. If it seems like it's still a little too soft to pipe, you can refrigerate the bowl of mousse again for 10 minutes or so until it firms up some more. 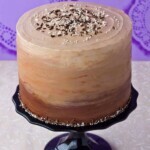 Transfer the mixture to a piping bag fitted with a large star or round piping tip. 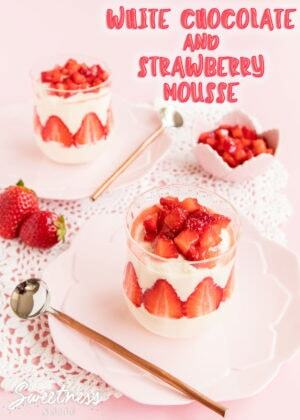 Serve the mousse eggs immediately or store in the fridge. 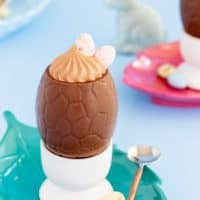 The mousse will keep for several days, but keep in mind that moisture may form on the outside of the egg when you bring them out of the fridge. The number of servings you get will depend on the size of your chocolate eggs. I used six 50g hollow eggs, but you could use smaller mini hollow eggs to get more servings. *The cream you need for this known by different names in different countries. In NZ it’s called standard cream or whipping cream, in other countries it may also be known as heavy cream, single cream or full cream. Long story short: you need a pourable, un-whipped cream that is around 35% fat. It will usually say on the bottle/carton that it is suitable for whipping.